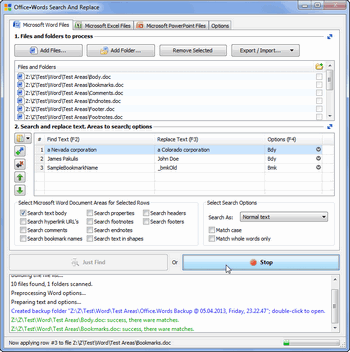 ﻿ Office•Words Search and Replace: hit many MS Office files at once. Office•Words Search and Replace at full tilt! Office•Words Search and Replace is a utility to bulk edit text in multiple Microsoft Office Word, Excel and PowerPoint documents at once. Office•Words is a neat and useful tool for resourceful people and clever companies. What it does is very simple: it searches Microsoft Office files (Word, Excel, PowerPoint) for text you specify and, if found, replaces that text with another of your choosing. Office•Words will edit multiple Microsoft Office files at once - just sit back and do something else while it's doing its job. 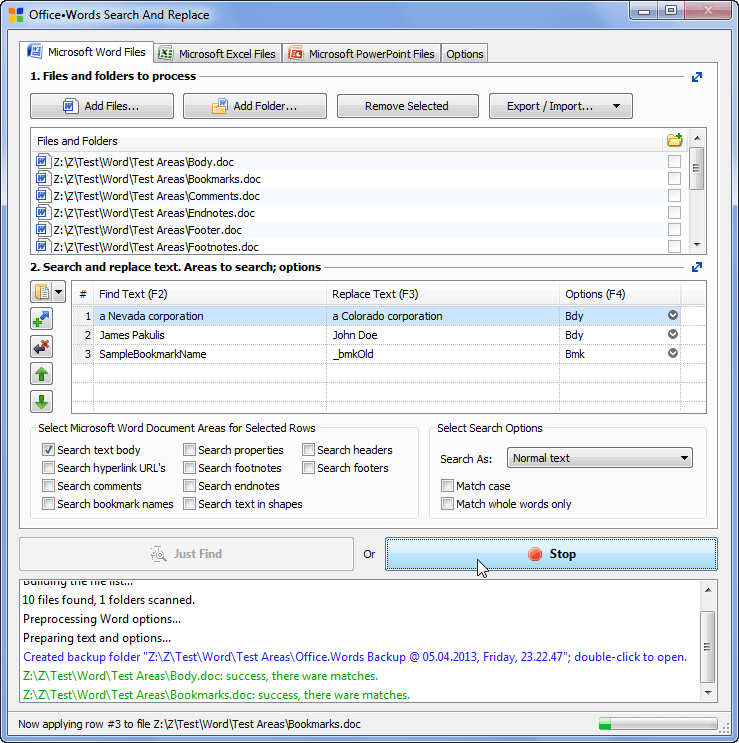 "How do you search and replace text across many Microsoft Word files?" Or in Microsoft Excel spreadsheets? Or in Microsoft PowerPoint presentations? This is the issue we've been asked to tackle by most of the businesses at the end of the financial year. for freelance translators and agencies: perform partial translation based on fixed dictionaries and more. Office•Words starts in a blink of an eye and has a negligibly small memory footprint. Office•Words runs on Windows 10 / 8.1 / 8 / 7 / Vista / XP / XP x64 Edition / 2000. Office•Words supports documents created in Microsoft Office versions 2000 through 2016, and requires that Microsoft Office is installed on your computer.